Many of us struggle from an unconscious drive to control our emotions, our surroundings, and the people in our lives. We learned to do this because at some point in our lives doing it kept us safe. However once the crisis is gone, we need to break this pattern of behavior and free ourselves. Mindful surrender can increase your health; physical, mental, emotional, and spiritual. 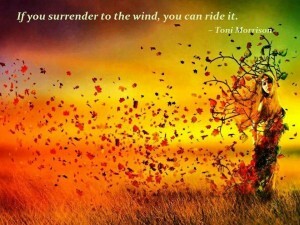 Surrender allows you to be more fully in the present moment, so you can respond to life instead of react to it. For some surrender can feel like defeat, it isn’t. That is our ego talking, trying to protect us, breath through that resistant thought and see how it feels to ride the wind for a while.